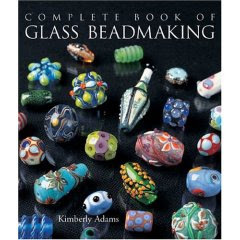 I still love Cindy Jenkins’s book called Making Glass Beads , because it was the first lampworking book that I bought. But I have to say that if you are just beginning the artform now, I’d have to recommend Kimberley Adams's book. There have been some changes in availability of different tools, torches, kilns, and glass since Cindy’s wonderful book was published, and Kimberley writes of her gratitude to her early teachers. I found this book to be a wonderful refresher on the basics, plus it had intermediate and advanced sections with techniques that I’ve not tried before. If you think that making your own glass beads is beyond your reach, think again! This drool-worthy full color book will have you running for the phone to order supplies. Although I think it’s certainly possible to teach yourself to do lampwork from a book that has great information and pictures like this one, I still am glad that I did a weekend course from a qualified instructor first. For one thing, a good torch set-up and a kiln are not inexpensive, so it’s nice to try it out before you make the commitment to buy the equipment. Warning ~ glass is addictive in and of itself, and melting it is even moreso. There. You’ve been warned!